Platinum Matching Pair of Wedding Rings — Form Bespoke Jewellers Ltd. Designed to compliment each other, a beautiful platinum matching pair of wedding rings. These platinum wedding rings have a shaped inside called a court fit (comfort fit) and a flat top. The ladies ring is set with diamonds all around to one side and a satin finish opposite. 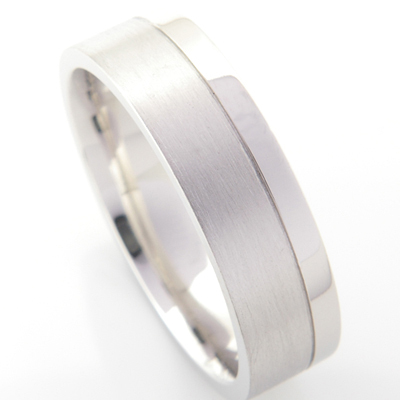 The gent’s ring is the same shape but slightly wider and a third across has a groove separating the two finishes, one satin the other polished, giving the rings a nice feeling of being a pair.